“This latest work extends the capabilities of our multi-material bioprinting platform to thick human tissues, bringing us one step closer to creating architectures for tissue repair and regeneration,” says Wyss Core Faculty member Jennifer A. Lewis, Sc.D., senior author on the study, who is also the Hans_rg Wyss Professor of Biologically Inspired Engineering at SEAS. 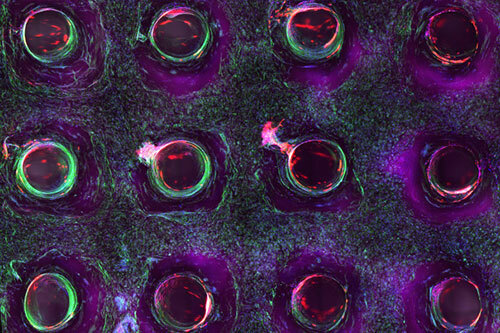 In the study, Lewis’ team demonstrated the 3D printing of one centimeter-thick tissue containing human bone marrow stem cells surrounded by connective tissue. By pumping bone growth factors through the supporting vasculature lined with the same endothelial cells found in our blood vessels, the team induced cell development toward bone cells over the course of one month. Lewis’ novel 3D bioprinting method uses a customizable, printed silicone mold to house and plumb the printed tissue structure. Inside this mold, a grid of vascular channels is printed first, over which ink containing living stem cells is then printed. The inks are self-supporting and strong enough to hold shape as the structure’s size increases with each layer of deposition. At intersections meeting within the foundational vascular grid, vertical vascular pillars are printed, which interconnect a pervasive network of microvessels throughout all dimensions of the stem cell-laden tissue. After printing, a liquid composed of fibroblasts and extracellular matrix fills in the open regions around the 3D printed tissue, cross linking the entire structure. “Having the vasculature pre-fabricated within the tissue allows enhanced cell functionality at the deep core of the tissue, and gives us the ability to modulate those cell functions through the use of perfusable substances such as growth factors,” said David Kolesky, a graduate researcher at the Wyss Institute and SEAS and one of the study’s first authors.